TV with Thinus: SABC spin tsar Kaizer Kganyago again goes on SABC News to say the SABC's requested billion rand bailout from government is not a 'bailout' - but it is. SABC spin tsar Kaizer Kganyago again goes on SABC News to say the SABC's requested billion rand bailout from government is not a 'bailout' - but it is. 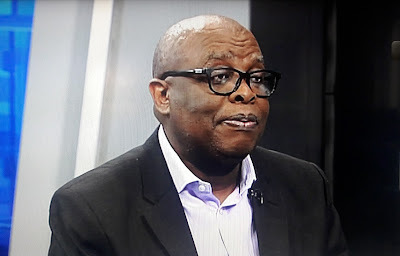 The SABC spokesperson Kaizer Kganyago again went on SABC News (DStv 404) to say that the SABC's latest billion rand requested bailout from the South African government is not a "bailout" - only it is. Hilariously, Khanyisile Kweyama, SABC board interim chairperson, herself uses the word bailout to describe the latest financial lifeline of billions of rand the SABC urgently requires for the cash-strapped and struggling South African public broadcaster to stay afloat. Other SABC interim board members like journalist and editor Mathatha Tsedu also uses the word bailout. Funnily enough, the essentially bankrupt South African Airways (SAA) - awaiting yet another mega-billion bailout from government - and South Africa's government are both calling and referring to the SAA's looming cash-injection as a bailout. Yet the SABC's Kaizer Kganyago wants to spin the SABC's bailout as not being a bailout - but it is. Question: Can the SABC, once again hovering on the edge of a financial cliff like it did in 2009 when it got a government bailout, get the money without the South African government guaranteeing a mega-billion rand bank loan for the SABC? That is what makes it a bailout. The ameliorative way the SABC wants to talk away what it wants and what will likely be happening - a bailout - by using padded, softened words, is a disservice to the South African public. The dictionary definition of a bailout reads: "an act of giving financial assistance to a failing business or economy to save it from collapse". "A bailout is a situation in which a business, an individual or a government offers money to a failing business to prevent the consequences that arise from the business's downfall. Bailouts can take the form of loans, bonds, stocks or cash." From the economic definition, it's very clear that what the SABC requested is a bailout, and that, if given again by the government, would be classified and can very correctly be described as a bailout. It is important to not use euphemisms and SABC PR speak like "government-guarantee" when the word "bailout" is what the SABC is asking for and a bailout is what the mismanaged SABC wants just 9 years after its previous bailout. Extremely troubling is the secrecy of Ayanda Dlodlo, minister of communications, around the SABC's latest bailout. Ayanda Dlodlo promised transparency but is actively blocking the South African TV industry, SABC audiences and the South African public from knowing what bailout amount the SABC asked the South African government for. Ayanda Dlodlo's refusal to make the SABC bailout amount requested public - a billion rand amount she's kept secret for over two months and counting now - damages democracy and South Africa's TV industry. Without knowing the bailout amount, the South African public, citizens and South Africa's TV industry can't debate the issue; can't have a public conversation of whether it's appropriate, or whether its sizeable enough or not. Is appears that Ayanda Dlodlo wants to announce to South Africa's TV industry and the South African public only that the SABC got a bailout after its been approved by South Africa's treasury - an after-the-fact, fait accompli. South Africans are not trusted - in fact held in apparent contempt - by Ayanda Dlodlo who is not transparent publicly about what the nature is the financial help is that the SABC requires, although she knows. It's not clear why South Africa can only know after the SABC has been given a bailout, what the bailout was/is/will be. With other government bailouts - for instance SAA, and others - the request is made public knowledge with ordinary South Africans knowing what size of money injection has been asked from the government - a government funded by its people. Part of an open democracy - and for it to function successfully - is for its government and public institutions to communicate accurately with its citizens and to use correct words, and also to give citizens access to the public information from its public institutions to help them to make better and informed decisions.